The First Real Solution for Reducing Your Exposure to Cell Phone Radiation Up to 98%*! As a future-thinking health technology company, LifeWave has propelled itself to the forefront of this critical problem by developing an innovation that’s the first of its kind. It’s now possible to have the peace of mind in knowing you are doing everything you can to help reduce you and your family’s exposure to cell phone radiation. Matrix 2 is proprietary to LifeWave and is so effective that laboratory testing has shown up to a 98%* reduction in cell phone radiation. Matrix 2 technology is radically different than any other radiation shield product on the market today, most importantly, because it’s been tested to be effective by an independent laboratory. In our laboratories, LifeWave tested numerous other radiation shields available and discovered that those products did not work as advertised. The cell phone you use every single day emits the exact same type of radiation as a microwave oven. The same radiation cooking your food is continually directed at one of the most sensitive areas of your body: your brain. The danger of cell phones is a heated debate today. While certain governments have maintained cell phone microwave energy is safe, reports from the World Health Organization and some independent scientists from around the world have indicated that cell phones may not be as safe as we once thought. In the end, is it worth the risk? On the Dec. 6 2013 episode of the Dr. Oz Show (“Why You Should Keep Your Cell Phone Out of Your Bra”), Dr. Oz said he believes there’s a definite link between cell phones and cancer. Dr. Oz’s guest was Tiffany Frantz, a 23-year-old Pennsylvania woman who was diagnosed with breast cancer in 2011. Frantz and her mom Traci were shocked because Tiffany was healthy, 21 years old at the time, and had no family history of cancer. But Tiffany revealed she had carried her cell phone in her bra all day, every day, for four years. Frantz developed cancerous tumors in the exact same area of her breast, on the same side, where her cell phone rested hour after hour, day after day, for four years. Frantz’s doctors were puzzled by her cancer, so she underwent genetic testing, which came back negative (meaning she was not predisposed to cancer). In March 2012, Tiffany got surgery to get her left breast removed, and underwent radiation treatment. Unfortunately, her ordeal wasn’t over. In February 2013, doctors told Frantz her breast cancer had spread to her hip, and cancerous lesions had developed on her spine, pelvic bone, ribs and skull. She underwent radiation treatment again, and now takes cancer drugs and gets intravenous bone-building treatments. Tiffany’s oncologist has never publicly stated that Frantz developed breast cancer because she stored her cell phone in her bra, but a small group of other young women have reported similar breast-cancer patterns. And Tiffany and her mom are 100% convinced that her cell phone did, in fact, cause her cancer. Earlier this week, Dr. Andrew Weil warned against the dangers of cell phones and WiFi systems on the Dec. 3 episode of the Dr. Oz Show. Keep cell phones away from your head. Use an ear piece for cell phones. Keep Wi-Fi routers outside the bedroom. Dr. Oz has previously stated that the heat emitted by cell phones can spur cell damage, and that can fuel cancer, so all women should stop storing their cell phones in their bras as a precaution. And everyone should refrain from placing cell phones anywhere on their bodies for extended periods of time. A new study raises concerns of a possible association between cell phone radiation exposure and breast cancer in young women. Don’t let your children use a mobile phone or a 3G data connection (without strict guidance) ! First, look at the picture and differences in adult’s and child’s skull and how radiation is absorbed. The picture is originally from Om Gandhi. 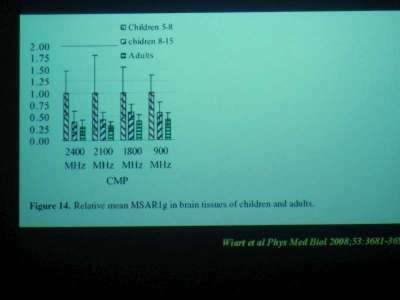 Preadolescent children are more vulnerable [to microwave radiation] because of their thinner skulls, their still developing nervous systems, their increased levels of cell division, and their less robust immune systems. In the conference professor Lennart Hardell pointed that the risk of Glioma (brain cancer) of a child is 5.2 times higherthan compared to an adult who has started to use mobile phone when … he was already grown-up. I recommend the following papers from Hardell & Co:  ,  , . The research originally from Wiart et al. (2008) demonstrates SAR values in child’s head compared to adult’s head. As the picture indicates, children have higher radiation absorption rates till 15 years age. Pulsed or UMTS-modulated radiation from a mobile phone makes the blood-brain barrier leak –> substances and chemicals from blood circulation are able to access brain. Radiation affects the pineal gland and reduces melatonin production –> According to Dr John Walker that is the main cause in the UK’s (mainly breast and skin) cancer clusters close to some base stations. Radiation removes calcium ions in cells and makes them leak. Radiation breaks DNA-double strands, through reactive oxygen species increase.